As has become tradition with the last number of Star Wars films, Empire is featuring a special subscriber cover for Solo: A Star Wars Story. The June issue showcases artwork by Dan Mumford, and is expected to be available April 19. For the last three years Star Wars has been something of an early Christmas present, with The Force Awakens, Rogue One and The Last Jedi all arriving in cinemas in December. But the saga is back already with a big, bold summer blockbuster in Solo: A Star Wars Story, presenting a new look at the origins of the galaxy’s greatest scoundrel, Han Solo, and how he came into contact with Chewbacca, Lando Calrissian, and the Millennium Falcon. You’ve never heard of the Millennium Falcon? It’s the ship that made the Kessel Run in less that 12 parsecs, don’t you know. 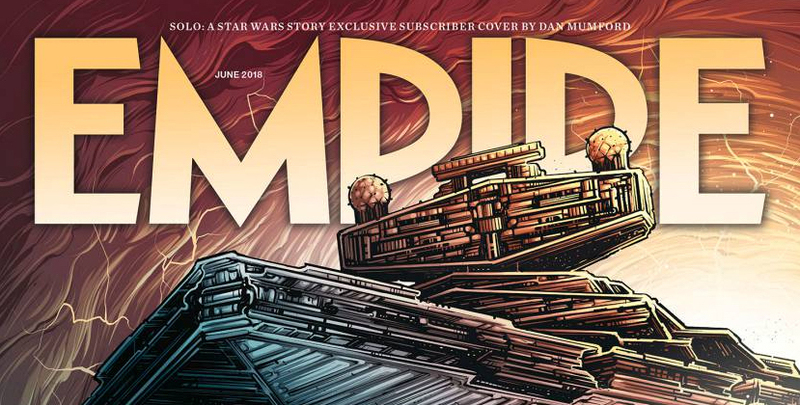 Of course you know the Falcon — the Solo subscriber cover for Empire’s June issue, drawn by Dan Mumford, depicts the iconic ship flying not-so-casual through a swirling lightning-filled vortex, pursued by an Imperial Star Destroyer and a swarm of TIE fighters. Inside the issue is an exclusive look at the Ron Howard-directed Solo, which sees Hail, Caesar! break-out star Alden Ehrenreich step bravely into the boots of one of cinema’s most iconic characters. Want Empirewith covers like this delivered to your door every month? Head this way to sign up for a subscription.